Science today is typically practiced by groups working in isolation, frequently with barriers to the sharing of data that arise from our need to protect intellectual property. Papers frequently do not disclose negative results, and the danger of being “scooped” often arises because we are unaware of what others are doing. 1 Open Science is a Research Accelerator, M. Woelfle, P. Olliaro and M. H. Todd, Nature Chemistry 2011, 3, 745-748. 2 Resolution of Praziquantel, M. Woelfle, J.-P. Seerden, J. de Gooijer, K. Pouwer, P. Olliaro and M. H. Todd, PLoS Negl. Trop. Dis. 2011, 5(9): e1260. The reviews for +Anders Steen Christensen's paper, submitted to PLoS ONE on 2013.07.24, are in. 1. Do ProCS-predicted chemical shifts predicted using all high resolution structures of ubiquitin compare poorly with experiment? That's not too tough to find out. 2. "Can the authors show improved structure validation characteristics when using more conventional evaluation criteria (e.g using the Protein Structure Validation Software (PSVS), or RDC Q factors)?" The problem is were dealing with ensembles of 1000s of structures, so unless we can find an downloadable version of PSVS, this won't be possible. Also, I don't believe PSVS scores report on anything directly associated with backbone amide hydrogen bonds, so I am not sure what the answer would tell us. Wrt RDC Q factors, that'll take a while to write the code for questionable benefit. Should we argue on this or try to do it? 3. Depositing the structures. We need to find a place that'll accept 10-20 GB files. Thank you for submitting your manuscript for review to PLOS ONE. After careful consideration, we feel that your manuscript will likely be suitable for publication if it is revised to address the points below. Therefore, my decision is "Minor Revision." We invite you to submit a revised version of the manuscript that addresses the three points that reviewer #1 raises. The first point in particular concerning errors in chemical shifts due lack of ensemble sampling in x-ray structures may require considerable work but would be of serious benefit to thrills. When submitting your revision, we need you to address these additional requirements. 1) Please ensure that you refer to Supplementary Figures S1, S4 and S5 in your text as, if accepted, production will need this reference to link the reader to the Figures. ASC is funded by the Novo Nordisk STAR PhD program. MB is funded by the Danish Council for Independent Research (FTP, 09-066546). WB and K L-L are supported by a Hallas-Møller stipend (to K L-L) from the Novo Nordisk Foundation. The funders had no role in study design, data collection and analysis, decision to publish, or preparation of the manuscript. We note that you received funding from a commercial source Novo Nordisk. Please respond in the cover letter to declare this commercial funder, along with any other relevant declarations relating to employment, consultancy, patents, products in development or marketed products etc) and if true, you should also confirm that this does not alter your adherence to all the PLOS ONE policies on sharing data and materials, as detailed online in our guide for authors http://www.PLOSone.org/static/editorial.action#competing by including the following statement: "This does not alter our adherence to all the PLOS ONE policies on sharing data and materials." Please note that we cannot proceed with consideration of your article until this information has been declared. We can make any changes on your behalf. Reviewer #1: The manuscript builds on earlier work for 1H chemical shift calculation using QM methods to parameterize a novel method (ProCS) to rapidly predict 1H chemical shifts by adding the various terms, assuming their additivity applies, which the authors demonstrate to be a good approximation within the errors that one has to deal with. The 1H chemical shift prediction errors with ProCS remain high compared to the empirical programs "on the market" today, but as the authors argue (probably correctly) these prediction errors are dominated by structural noise, and empirical methods have been optimized to be as insensitive as possible to errors in the input coordinates. They then take advantage of this extreme sensitivity to structural errors by including the difference between ProCS and experimental shift as a "constraint" when refining the structure with their MCMC method, and validate the improvement in structural quality by showing improved agreement between experimental h3JNC' couplings and values predicted on the basis of H-bond geometry by the Barfield equation, showing dramatic improvements in agreement (i.e., presumably in H-bond geometry). Although the method appears computationally more expensive than the popular CAMSHIFT program, it clearly offers a new and potentially more powerful approach for refining structures directly against amide 1H shifts. I believe the work is potentially important and of suitable quality for publication in PLOS One, but would like to see the two minor issues raised below addressed prior to its publication (as I presume many readers will have the same questions). 1. 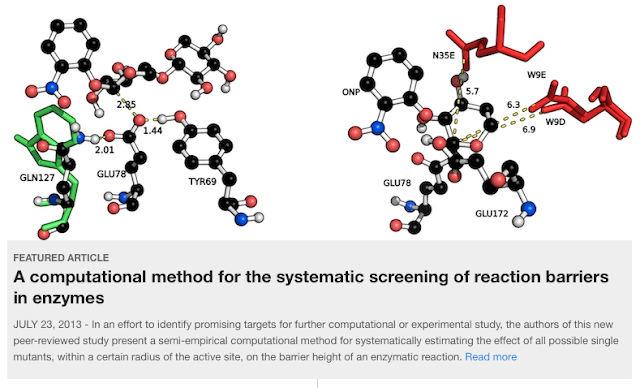 The authors comment that the inability to reproduce the experimental chemical shifts by QM methods may be caused by the fact that X-ray structures represent merely one snapshot of what in real life is a statistical ensemble (p.4). If that is true, one would expect all high resolution structures of ubiquitin to agree rather poorly (there are at least a dozen with X-ray resolution <=1.8 A). Is this true? Is it also true that ensembles refined against the experimental h3JNC' couplings (e.g. 2K39 or 2KOX) fit better than single structures (e.g. 1D3Z)? 2. Both HN chemical shift and h3JNC' are dominated by H-bond length, and the improved fitting of chemical shifts after refinement is therefore perhaps a bit circular. Can the authors show improved structure validation characteristics when using more conventional evaluation criteria (e.g using the Protein Structure Validation Software (PSVS), or RDC Q factors)? Reviewer #1: The atomic coordinates of the refined structures of the three proteins studied should be deposited. 4. Is the manuscript presented in an intelligible fashion and written in standard English? 6. If you would like your identity to be revealed to the authors, please include your name here (optional). The reviews for Martin's last paper (which we submitted 28 days ago) came back July 31st and can be found below. Before I could even present them in a blogpost Martin had a response ready, which was sent in late yesterday and promptly accepted (I am glad I managed to upgrade before that happened!). Anyway, I am really happy the paper found a home at +PeerJ, especially considering the only remaining alternative. Thank you for your submission to PeerJ. I am writing to inform you that in my opinion as the Academic Editor for your article, your manuscript "In silico screening of 393 mutants facilitates enzyme engineering of amidase activity in CalB" (#2013:07:643:0:0:REVIEW) requires some minor revisions before we could accept it for publication. Please address critical points raised by the first reviewer. This manuscript describes in silico screening of CalB mutants for enzymatic amidase activity. Then the computational results are benchmarked against experimental studies. The computational approach gives reasonable results in general -- the authors demonstrate that 15 out of 22 mutants are correctly predicted in qualitative activity. The manuscript is scholarly and well written. The methods are complete and clear. The data are new and appear to be true. I recommend publishing with minor revision. I have a few minor suggestions/questions. 1. In table 1, two columns are both labeled with “Cat.” The authors need to make more detailed labels to distinguish (one from Exp. and the other is from Calc.). Also, the authors need to include the cutoff of 12.5 kcal/mol in the table legends otherwise it is difficult for readers to correlate calculated barriers with calculated cat. 2. In pg. 8, the authors state that the cutoff is done purely for a post hoc comparison of experimental and computed data. And they used 12.5 kcal/mol as cutoff. The authors need to expand this section to give detailed descriptions about how they reach the value of 12.5 in their study. 3. For results and discussion part, the two subtitles are “Set S” and “Set L”. It might be useful to guide readers if the authors can use more detailed subtitles which can generally summarize their results. 4. In the last part of results and discussion, the authors state that I189G as a single mutant is counterproductive but lowers the barrier of G39A-A141Q-L278A. This would suggest there are couplings between I189 and G39/A141/L278. While it is difficult to figure out such kind of couplings, one simple question is, is I189 close to G39/A141/L278 in the structure. This is an excellent paper, nicely demonstrating the utility of a practical computational modelling approach to the prediction of enzyme activity. The method uses semiempirical quantum chemical methods to model amidase reactivity in a lipase. This is thorough work of high quality. The paper is well written and the results are analysed and presented in appropriate detail. The results will be of wide interest. This is a demonstration of a method that will find real industrial application, as well as in other contexts. The paper is suitable for publication essentially as is. A minor point is that some of the references might be lacking information (e.g. refs 27 and 28 do not look complete as written). Also, the authors might want to comment a little more on how amidase activity is achieved. There is wide debate about amidase versus esterase activity, and, while this is not the focus here, comparison with enzymes such as fatty acid amide hydrolase, which has been the subject of much modelling work, could be useful (e.g. a little more discussion on what specific features may provide amidase activity and how the designed amidases compare to natural amidaases). This could assist in future rational design (as well as in testing the quantum chemical methods by comparisons on related reactions. This post is a response to this post by Rosie Redfield. I think this is the fundamental disconnect in the discussion. I think most OA advocates on-balance don't see the commercial use of OA content allowed by the CC-BY as a bad thing. I don't think the "The authors shouldn't see this as harmful" responses you mention in your comments are blaming the authors. Rather, people are trying to tell them something important about the fundamental motivation behind OA: gratis vs libre (http://www.sparc.arl.org/resource/gratis-and-libre-open-access). Are you just free to read the paper or can you do something with it? Martin's paper has been recently accepted in PeerJ, and it is now showcased as 'Featured Article' on the journal web page. Way to go!